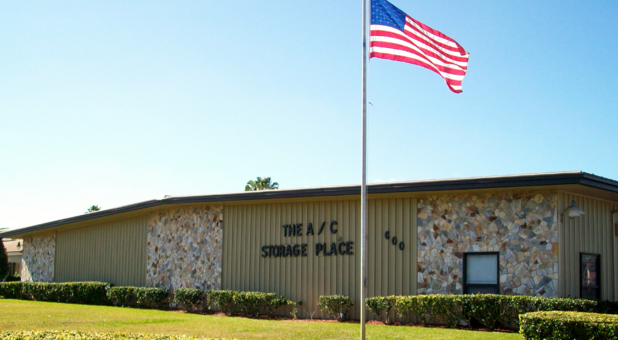 The A/C Storage Place is the #1 provider of air-conditioned self storage in West Melbourne, Florida. We have 15 different unit sizes, all located on the ground floor, for the perfect combination of protection for your belongings and convenience for your move. Whether you live in Melbourne, Satellite Beach, Palm Bay, June Park, Palm Shores, Indian Harbour Beach, Indialantic, Melbourne Beach, or any of the surrounding neighborhoods, our team wants to speak with you! Located across the street from Bizzarro Pizza, Heavenly Treats Bakery, and 7-Eleven, our property offers access hours from 9 a.m. to 5 p.m. every day of the week. With ventilated siding for unobstructed air circulation, 100% air conditioning, and electronic security for each entry door that’s monitored by the police and fire departments, we go above and beyond what you’d expect at a typical storage facility. We even provide office hours every day of the week! You won’t find that level of service anywhere else in the area. Look for our facility near Sunbelt Credit, Mariner Finance, Davidson’s Tire Town, and East Coast Screens. Our team has more than 35 years of experience serving this community, and you’ll quickly see that our knowledge of the industry and the neighborhood translates to a better renting experience for you. We provide refunds on prepaid rent, pest control twice a month, camera security viewing all entry doors, and a strict policy of no administrative fees and no deposits. We always have at least two staff members on duty every day, so come on down to check out our storage units! We’re confident you’ll love the variety, services, and prices that we offer. Call or stop by today to see for yourself.